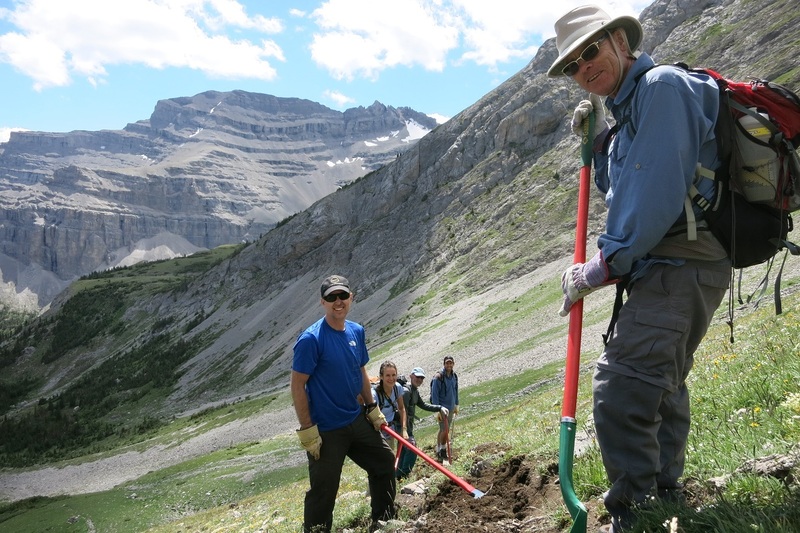 Twenty-one volunteers spent four days (July 24 to 27, 2014) working to repair damage to the Great Divide Trail caused by the June 2013 floods and re-established the trail from Tornado Saddle to the ridge crest north of Hidden Creek. Two bridges over South Hidden Creek were built, trail and cairns were constructed up to Tornado Saddle and the entire 16 kilometre section of trail was cleared and re-blazed. 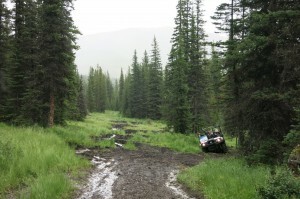 The trip got off to a rocky start on Day 1 when the Bobcat carrying much of the camp gear got stuck in a bog and took the work of a dozen volunteers and almost two hours to get it unstuck. At the same time, it started to rain and the temperature dropped, resulting in some icy sleet and a cold, wet trail crew. But the situation quickly improved when the Bobcat returned with a load full of dry, warm clothing, a fire was started and steaks were grilled for dinner! 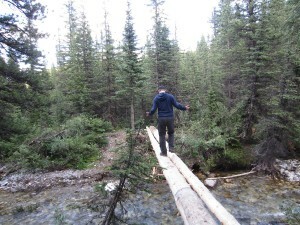 Bridge Crew – built two bridges over South Hidden Creek. This work involved strong backs and creative minds to get the logs across the 12 metre span over the creek. The logs were stripped clear of bark, secured to the sills, and covered in linseed oil and wire mesh. 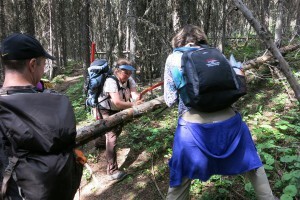 Clearing/Blazing Crew – removed brush and fallen trees, and blazed the trail to the ridge crest north of Hidden Creek. 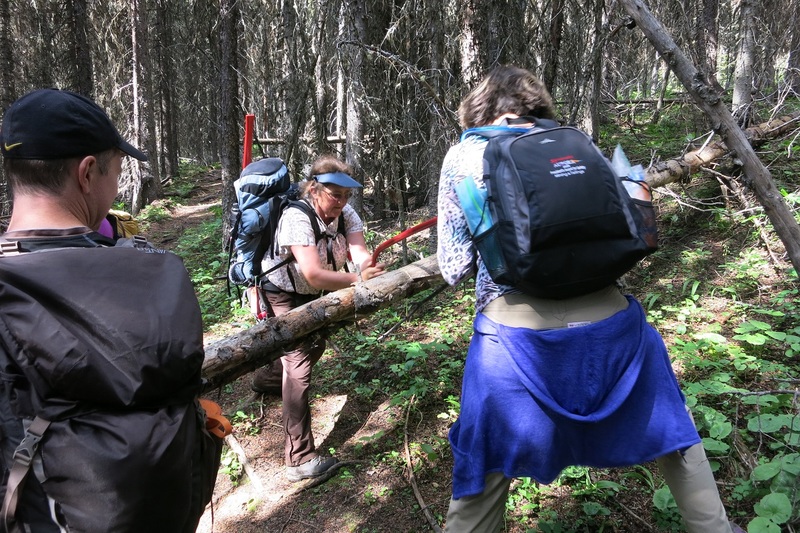 This work involved using a chainsaw to cut fallen trees, polesaws and loppers to remove brush and re-establish the trail corridor, and painting blazes on trees to mark the route. Saddle Crew – established the trail from South Hidden Creek to Tornado Saddle. 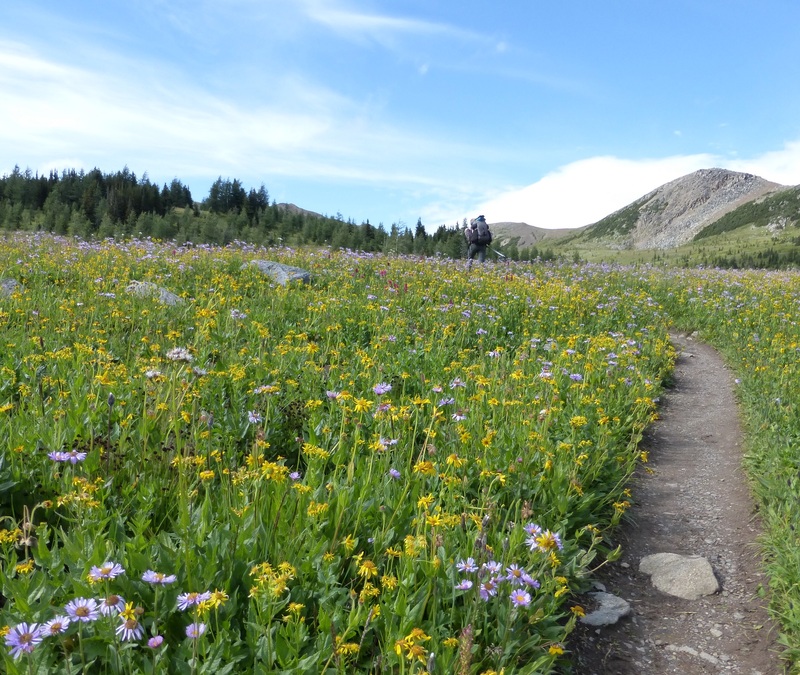 This work involved using mattocks and shovels to build switchbacks up the steep slope below Tornado Saddle, piling of rocks to create cairns, and paint blazing of the cairns to mark the route. 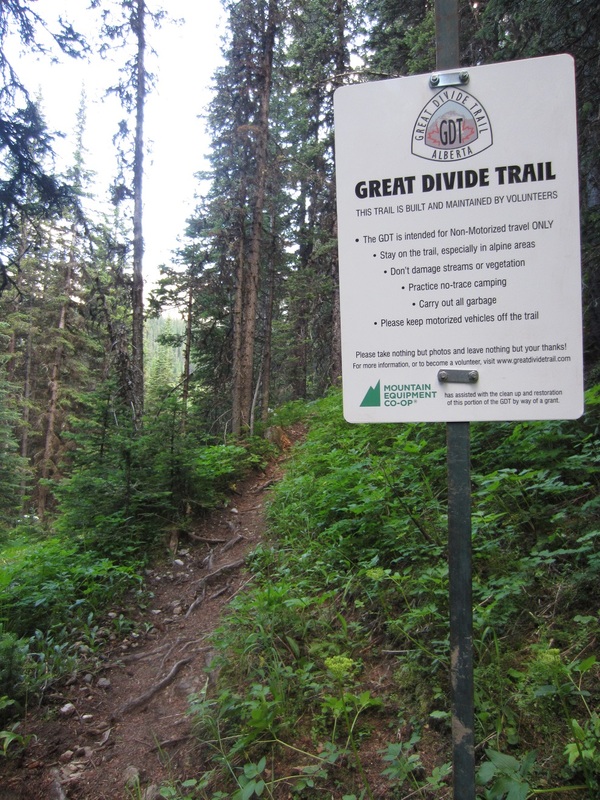 Three GDT signs were placed on the trail at junctions with ATV tracks. 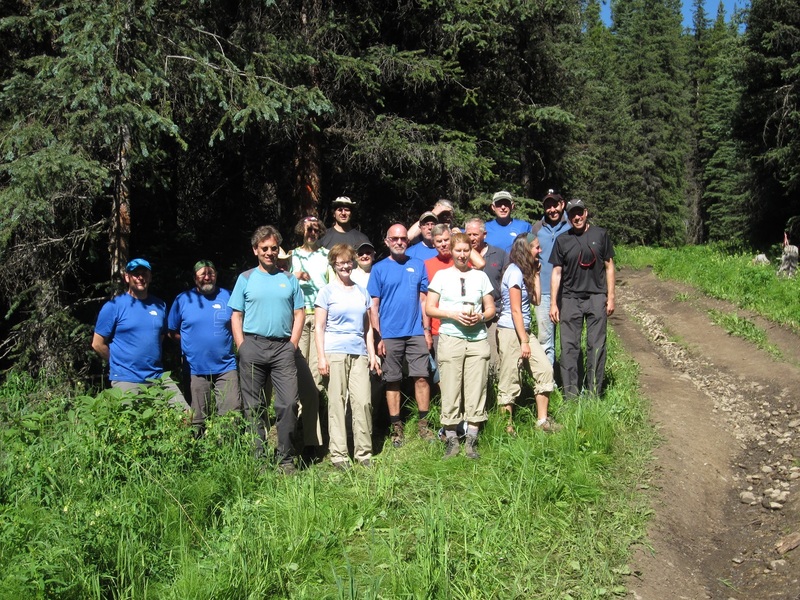 Thanks to all of our hard-working and enthusiastic volunteers who participated in this year’s GDT Trail Maintenance Trip! Special thanks to our sponsors for making our trip possible: The North Face, MEC, Cervus Equipment, Stihl – Thank you!